IN THE "PLAIDS" of 1971-74, horizontal and vertical bands and stripes interlaced. At first these were an extension of the stripe paintings, especially the later ones in which panels of color were sandwiched between clusters of narrow stripes. In the early plaids these stripes at top and bottom were transferred also to the vertical. Later they came to intersect at intervals throughout the surface instead of just at the edges. 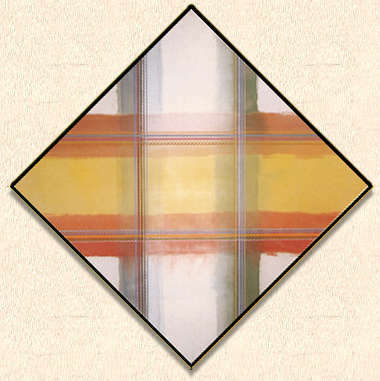 The "Plaids" were the first of Noland's mature paintings to attempt the overlapping of colors and his first obvious attempt at painterly painting. Here, for the first time, color crossed over color -- albeit in thin washes. This produced many beauties, but paint materials weren't yet ready to provide the complexity Noland came to explore in his second series of "Chevrons" of the '80s.